As much as times change, there are few things that never go out of style. This perfectly applies to tiles in the bathroom that are still the best option for the lining the walls. What has changed is just some motifs, some textures, sizes, colors and shapes, which gives you a lot more choices now than before. While having so much choice is great for the eyes, it becomes a daunting and a confusing task to choose the perfect combination for your washroom. To make things easier homify brings to you seven tile combinations, that will make you love the spend you spend in the bathroom. Who likes monochromatic walls of large tiles anymore? What it really takes now to create is to use different colors and textures. 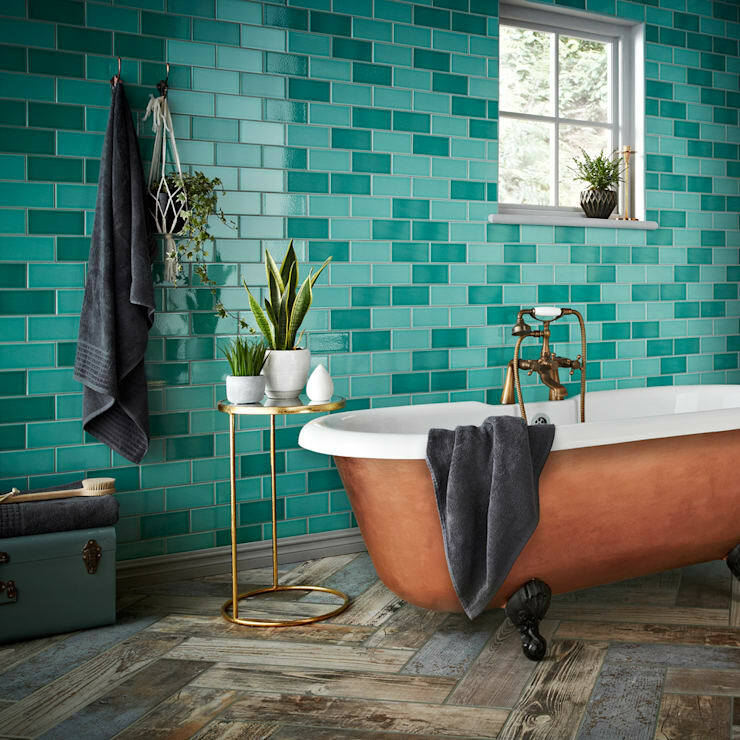 Either to delimit spaces, or to combine them, the mixture of tiles is a trending topic, and this trend is here to stay. In this luxurious bathroom the black tile, of industrial cut, has been combined with golden borders of diverse prints that give a glamorous and wild touch. The combination adds glamour to this bathroom. The beautiful round golden mirror has added drama and royal touch to this elegant bathroom. With black ceramic tiles you need to have a lot of light in your bathroom, here are 9 ways to brighten up your bathroom. 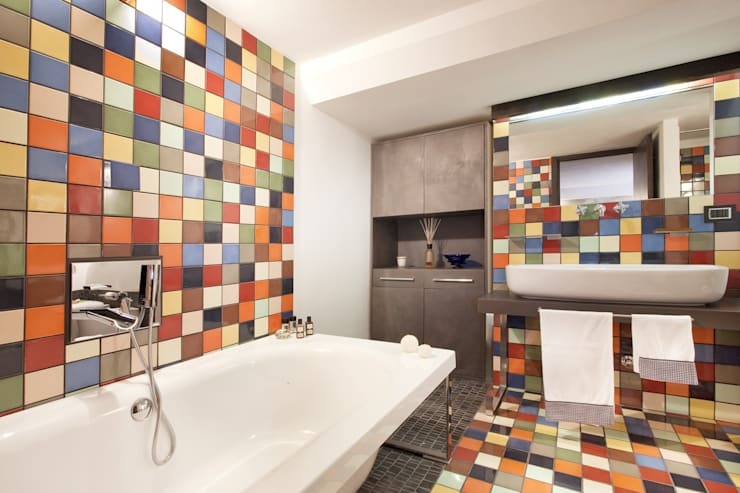 Combination of colored bathroom ceramic tiles in the bathtub gives it a fun twist. Today the tiles are not reduced to shower space, wall tiles have crept into rest of the rooms too. There can be infinite combinations of these small square tiles, and all of them will look equally good, playing with different shades of the same color. You can also use these small square tiles to create a shaded wall top to bottom! 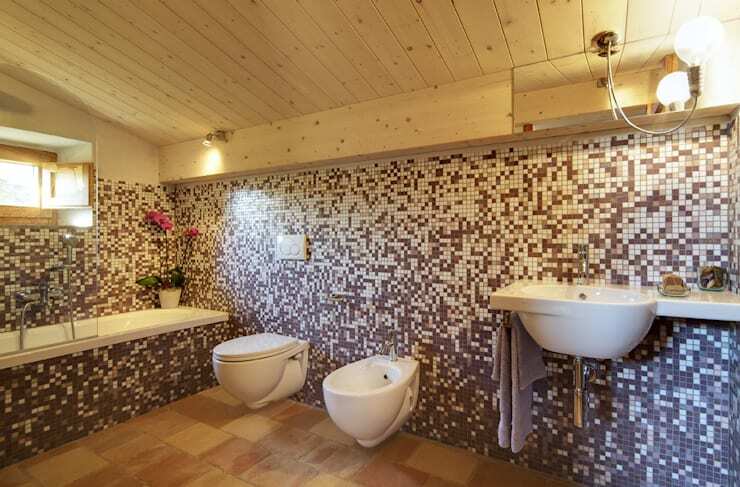 However, in this bathroom, the different shades of brown are combined with white, which is also found in toilets, to give a clearer and brighter touch to the wall. The combination of browns also plays with the ceilings made of wood, and also with the unpainted ceramic floors. Here are some wonderful ideas to decorate a neutral bathroom. Did you know the tiles in blue were first made for the pools to create the feeling of natural water that reflects the color of sky. So it would not be wrong to say that if there is one classic color for your bathrooms it is blue. Both the celestial and the marine, going through blue-gray, turquoise or indigo, are colors that you relate to water, and hence to the bathrooms. Using this combination in your bathroom, you can enjoy the summer swim nostalgia all year round! 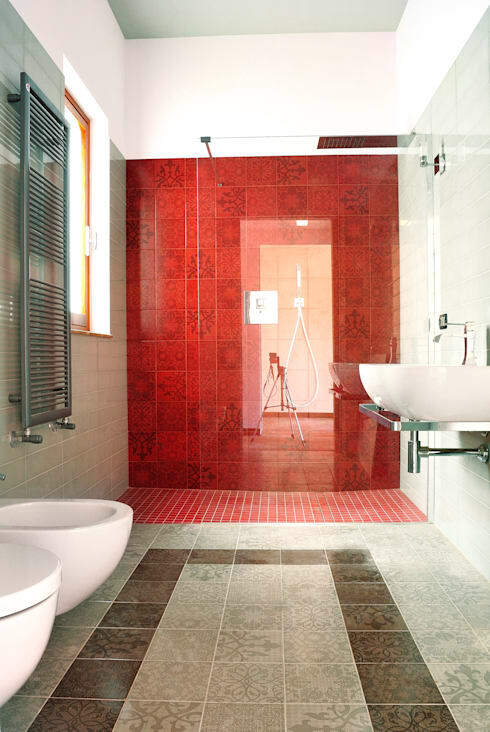 There can probably not be a clearer example of the use of tiles to mark the territories in the bathroom : Bright red bathroom tiles have been courageously used in the shower area, while beige and brown ceramic tiles are used in the rest of the bathroom. Red is not a common color when it comes to bathrooms, but if you are experimental, here are 10 ideas to give your bathroom as splash of uniqueness. But in addition to the combination of colors, the designers also have used different textures and sizes, which give more variety and style to the bathroom. The yellows and cream are combined with the grayish blue resulting in a subtle, warm and pleasant bathroom. The mixture of colors does not follow an established norm: sometimes the most yellowish tones predominate, other times there is more blue. It all depends on what effect you want to achieve, but generally it gives the best effect when there is no particular order. Here it is as important to choose the colors of your tiles well as is to install them correctly. Make sure you prepare the wall well before placing the tile and try to use a technique that prevents gaps between tile and brick, since these will be more fragile and can break easily. Green offers great contrast with whites and browns, both the colors, that are usually found in bathrooms. 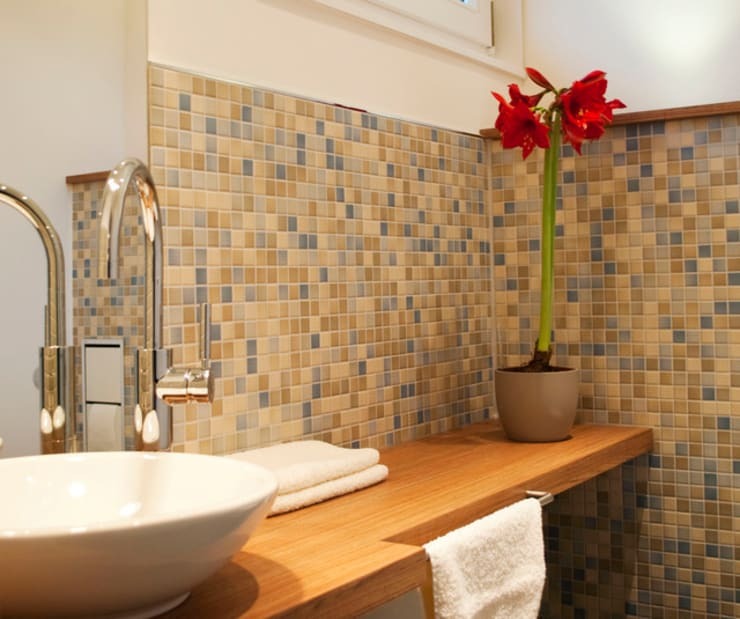 Green tiles add a natural and fresh feeling to your washroom. Throw in some plants too and feel like bathing in the lap of nature. In this picture the copper and white colors have created a beautiful antique environment for a lavish bath. And though it is easy to get carried away by the color and beauty of the tiles, you must always take into account the quality and the type of material of the same. Porcelain and ceramic tiles are the most common, but you can also opt for glass or natural stone depending on your choice. Love greens? See how to get more green in your home. ​Rainbow: why decide if you can have them all? In the rainbow there are seven colors together and no one complains that they do not combine, so if you want to experiment with all your favorite colors, do not restrain yourself! Yes, try not to occupy the entire bathroom, but nevertheless a colorful mosaic wall against a white or dull grey tiles will look amazing. For instance, you could make the shower area with with colors and just a narrow strip in the rest of the bathroom to maintain consistency. 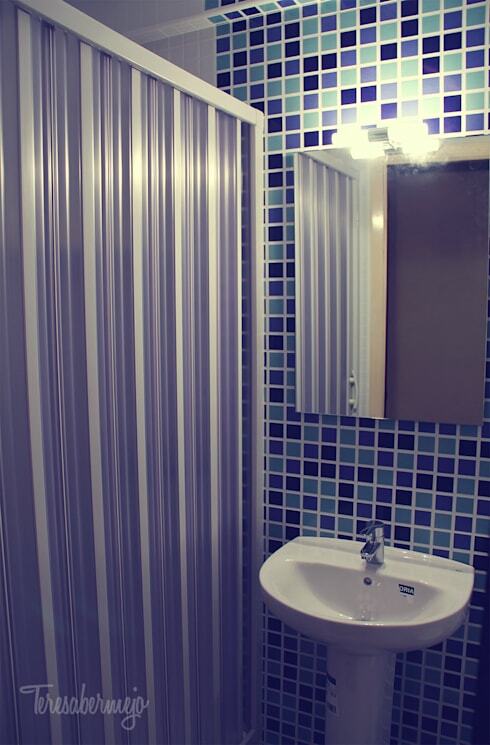 You could also try alternate ideas for covering the bathroom walls, beside tiles. Which color combination in tiles did you like the best? Let us know, if you want to suggest any other combination that you love.